Can you please identify them? Self explanatory, big muscular green guy with a radioactive symbol. As can be seen from is wikia page, he is often associated wth the purple and black. Furthermore various fan images exist of the bulls-eye symbol as noted below. Also extremely obvious, the symbol is a reference to his arc reactor heart. As can be seen from her logo on the Black Widow wikia page, the symbol above matches that for her name. We all know Captain America's symbol. But for good measure here it is again. The Hammer again is clearly Thor. Slightly more difficult to tell, the symbol is clearly the S.H.I.E.L.D symbol and as the Director of S.H.I.E.L.D it seems clear it must be him. Clearly our Favourite webslinger. The colour scheme goes back to the classic blue and red that the character sported throughout his comics career. Again, with the classic Wolverine haircut as seen so often, and the traditional yellow and black seen in the comic books. This is clearly our bladed friend, the Wolverine. The symbol is that of the X-men with Blue on Yellow. Again clearly our Telepathic leader of the X-men, the iconic wheelchair and Cerebro helmet stand out for the head of the School for Gifted Children. I was General Thunderbolt Ross. I became the very thing I hated most in life. I am the Red Hulk. And for all I've done... I deserve to die..
A US General, Thunderbolt Ross became the most famous nemesis of the Hulk, known as the Red Hulk. The symbol above reflects his profession in the United States Army. An enemy of Hawkeye, Crossfire was originally a CIA agent, who decided to use his skills to become a criminal. The symbol seen above is clearly seen on the left pectoral of the character in his depiction below. I pity you, Iron Man!! For though you do not even suspect my existence, you head the list of those the Mandarin has vowed to destroy! And the Mandarin never fails! After Natasha defected to the west, the U.S.S.R. (or Russia, as time moves on) continued the program that created her, and created a second Black Widow; a blond woman named Yelena Belova. Yelena no longer seems to be an explicit Russian operative (she was the field leader of the Thunderbolts during the Dark Reign storyline), but definitely has it in for Natasha, and would logically be represented by the same emblem. An alternative suggestion has been James "Bucky" Barnes, the Winter Soldier. While he and Natasha have had a romantic relationship, have worked together, and may well have clashed while James was still under the control of Russia/the U.S.S.R.), he doesn't seem a good fit as her arch-nemesis, unlike the other 9 characters on the lower row. The historical nemesis of Captain America, the Nazi personal agent for Hitler began to wear the Red Mask in the 40s. The Nazi symbol is used to refer to Red Skull's history as a member of the Nazi Empire. Loki, Thor's brother and nemesis, his symbol comes from the shape of the horns on his helmet. Such bluster. How very typical. Ever the sheltered son. So many fractured delusions. You know nothing of war. For all these countless millennia -- when it comes to the two of us -- you seem to have avoided the simplest of conclusions. Instead, you feel the incessant need to avenge every wrong you perceive from your position of languid morality...as if it were some sort of game. Quite sad. But if it's a war you truly desire, Thor -- then Loki can happily provide. I am Baron Strucker, the one who is about to reduce you to a helpless whining shell of a man! Are you ready?? The Green Goblin is one of Spider-Man's oldest and deadliest foes. The main character to use the name, Norman Osborn, was both insane, and the father of Harry Osborn, one of Spider-Man's best friends. Norman, of course, was the U.S.'s foremost "hero" during Marvel's Dark Reign storyline. An alternate suggestion is the Hobgoblin. Hobgoblin uses basically the same weaponry as the Green Goblin, as he got his start when he found one of the Goblin's caches of weapons. However, a close perusal of the image makes it clear this is the Green Goblin. Green Goblin's headgear includes a "hat" similar to a conical stocking cap (leaving the ears visible), where Hobgoblin's headgear is more like the hood of a hoodie (covering the ears). You can see the character's pointed left ear, and the trailing point of the cap between his head and right hand. The most obvious nemesis for Charles, Max Eisenhardt/Erik Lehnsherr was once friends with the Head of the X-men, however the two later had differences which led to them falling apart. Erik wanting revenge on the non-mutants, whereas Charles pleading with him to spare them. Magneto's Symbol is based off his iconic helmet, seen throughout the comics and the books. Community wiki to aggregate answers from other posts, including the original question. Feel free to edit in corrections or URLs. Don't forget to up-vote the source answers. 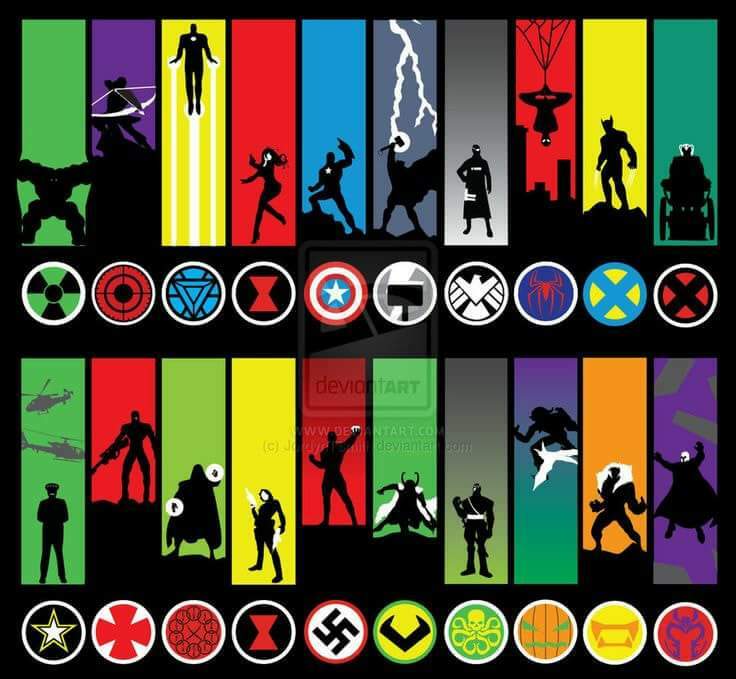 Following up on my comment it appears that on the top row are "heroes" and on the bottom rows are "arch-nemesis villains" to the corresponding hero above. Still not sure on 1, 2, or 4, I almost thought 2 might have been deadshot but I'm really not sure on that one. The match-ups seem to be heroes (top row) and their arch-enemies (bottom row). I can see the vague resemblance to Bucky Barnes here, but if it was him I would logically expect his arm to be colored differently, as it's a fitting way to differentiate him. Plus, despite his years as the Winter Soldier, counting him as Natasha's arch-enemy seems a bit off. The second Black Widow, Yelena Belova, is the most likely candidate, given that she has the same hourglass emblem shown. The art doesn't seem like a good match: she's a blond, and I think has generally been shown with longer hair, where the image would seem to indicate a darker hair color (or else it would be white, like her face), and shorter hair. That said, white is being used to highlight identifying features/trim in the characters (I'm sure the guns aren't white). Based purely on the image, I could make an argument for Madame Masque (the white highlight on the face would be her identifying mask, of course); but, the Widow emblem wouldn't make any sense there. This is the Green Goblin, not the Hobgoblin. The glider looks more like GG's; the "horns" on GG's glider were part of a flat faceplate, while the "horns" on Hobgoblin's glider protruded out from the faceplate. More tellingly, Green Goblin's headgear includes a "hat" similar to a conical stocking cap (leaving the ears visible), where Hobgoblin's headgear is more like the hood of a hoodie (covering the ears). You can see the character's pointed left ear, and the trailing point of the cap between his head and right hand. Trying to identify an old Marvel Comics robot villain (not Ultron) from the 1970s? Can you please identify these time travellers?